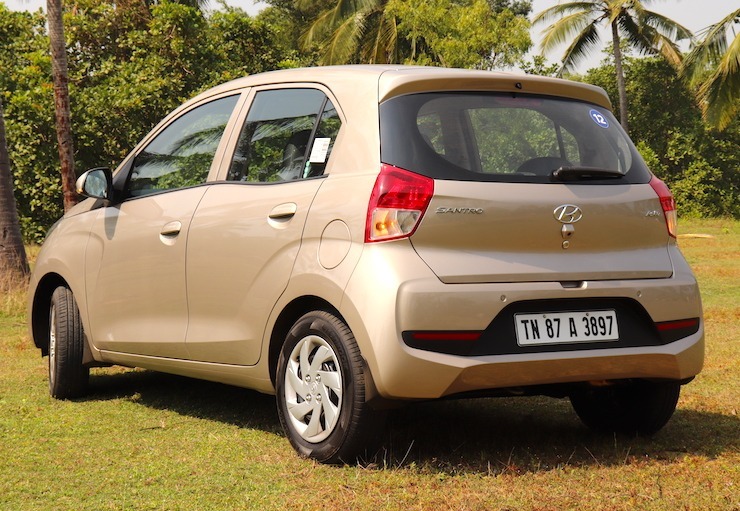 30,000 confirmed bookings in less than 25 days of its launch is what the Hyundai Santro has managed. This clearly showcases Indians have accepted the Santro brand name once again and we are sure you are eager to know how the car fares in real world driving. Well, we drove one from Bhubaneshwar to Konark and back and this is what we have to say about Hyundai’s latest offering – hit the play button right away! The new Santro really is an all-new product this time around. Apart from the name and the older 1.1 engine, there is nothing in common with the outgoing model that was discontinued in 2014. It looks different and though I am not a fan of the design, it has grown up in length and width, making it larger on roads than rivals. And thankfully, Hyundai has left out chrome treatment from the car – less chrome is good in my opinion. Its only when I stepped inside the new Santro is when a smile came on my face. This just doesn’t look like a Rs 4-5 lakh hatchback – and I am not talking about the design but quality of materials and that so important upmarket feel. First time buyers will appreciate this a lot. It’s a very spacious small too and inspite of reduced height, there is more than ample head room for tall passengers, even at the rear. This is also evident in my video above, so do watch it. Feature wise, Hyundai has upped the ante by providing segment best touchscreen interface that also has a reverse camera, steering controls and even rear air-con vents. Impressive. Powering the new Santro is the same 1.1-litre engine but it has seen heavy revisions. For example, max power goes up from 63 to 69 PS and torque takes a jump from 96 to 99 Nm. Likewise, the new Santro is more efficient with the certified economy being improved from 17.92 to 20.3 kmpl. It retains a 5-speed manual gearbox but Hyundai is offering an optional AMT for the first time. Needless to say, for urban runs, an AMT is highly recommended. The new Santro is available in five versions of Era, Dlite, Magna, Sportz and Asta. The mid level Sportz and Asta can be had in the AMT and CNG options as well. Yes, Hyundai is offering a factory fitted CNG kit too. Pricing starts at Rs 3.89 lakh (ex-showroom) and this in an introductory price for the first 50,000 bookings. Initial customers will also get warranty for 3 years / 1,00,000 km along with 3 years of RSA or road-side assistance. « Rolls-Royce: 10 biggest myths about these super luxurious cars BUSTED!